Unthinkable, Unethical, Unlawful ~ Good Grief! Most professionals that work within the estate industry hear and see things that defy logic and make our hair stand straight on end. This story is one of them. Imagine your sibling is very ill, in the process of passing away in hospice. Most of us would be doing all we can for our family, the children, the spouse, being present and offering support in any way to ease the pain they are going through. Most of us would also be spending those last precious moments together with the loved sibling. That is what family is for. But some families think of other things that wouldn’t even enter into our minds. While the ill sibling is unresponsive in a coma, a sibling helps themselves to not only their jewelry and silver, but their credit cards taken straight from their purse. Worse, yet, they USED the credit cards throughout the last week of the sibling’s life and even after they had passed away. Does anyone out there have the right words to describe this, because I am so appalled, I cannot print what I would really like to say? I believe it is unlawful to use someone else’s credit cards and certainly unlawful after their death, if you are not named on the account. Everything can be tracked these days. They always find the culprit right down to getting receipts, video recorded at the store, etc. So I ask a question that my mind is not capable of understanding: WHY would anyone do this when life is hanging by a thread and all they can think of is stuff? Unethical, YES. Unthinkable, YES. I cannot even wrap my head around it. Shoes, purses, jewelry, and all the silver or gold in the world doesn’t mean a thing when a loved one dies. It doesn’t mean a thing when we die. They are just pretty things that we use for awhile. They take up space and take money out of our accounts. But seriously? On a deathbed? What is becoming of our world? Are there people out there so devoid of compassion or kindness that they fill their void doing things that are unthinkable? I’ve seen cases like this in the past, but they happen more frequently and it is most disconcerting to witness. Yet another reason to have a plan in place, tell those closest to you what you want, and back it up with legal documents. If there are those you don’t trust, let those that you do trust know this too. Maybe the best investment we can make is a safe in our homes, offering the combination to only your executor or in sealed documents to be opened upon your passing. Gift items while you are still living. Have your power of attorney gather all personal possessions (such as your wallet) and secure them until such a time as legal affairs are sorted out. I’m still shaking my head in disbelief! Julie Hall, The Estate Lady®, is the foremost national expert on personal property in estates, including liquidating, advising, and appraising. http://www.TheEstateLady.com She is also the Director of American Society of Estate Liquidators®, the national educational and resource organization for estate liquidation. http://www.aselonline.com. Louise was a wealthy woman in her advanced stages of a terminal illness, was blind, completely deaf, and in her final stage of dementia. She could no longer communicate and decisions were being made for her by an old friend she trusted. Louise had never married and had no children, but did have four beneficiaries to her estate. All four really loved her and provided the very best care for her in a beautiful health center for the remainder of her days. One of Louise’s passions in life was purchasing fine diamonds; she had several pieces that were very large and easily worth in the six-figure range. Everyday, she wore them because she loved them. Louise bathed in them, napped in them, slept in them, and ate in them. The beneficiaries started to grow concerned about these pieces of jewelry Louise wore on her person, for a number of reasons. Most people don’t even have pieces as valuable as these, and if they did, the pieces would be kept in a safe, vault, or safe deposit box. The beneficiaries did the right thing in requesting the rings be removed while Louise was napping, to have the genuine diamonds replaced with less expensive stones, in the event something should happen to the rings. The genuine diamonds would then have been turned over to the trustee of the estate and secured. Who could possibly blame them for wanting the diamonds protected? Unfortunately, the decision-maker overseeing Louise’s assets insisted that Louise should continue to wear those massive stones against everyone’s advice. One day, less than 2 weeks after this request to have each diamond removed and replaced with cubic zirconia, the massive diamond pieces Louise was wearing disappeared. Not only did these pieces disappear, but a video camera, some CDs and a crock put vanished as well from Louise’s home. This was a clear indication to the family that the caregiver, sitter, or someone else who had very close contact with her, had made off with the goods. The beneficiaries were beside themselves. Why didn’t anyone prevent this from happening? Why didn’t anyone listen to their request? With all the questions and accusations that flew, the damage was done. The diamonds were gone, never to be found again, probably sold at a pawn shop for a few thousand dollars and currently sitting in someone’s safe as their own retirement investment. who cannot make decisions for themselves. This story clearly demonstrates that we must exercise extreme caution with valuables. Remember to have them evaluated by a professional, have those values documented, and keep them in a safe place until they are either distributed to family or sold. The faces of exploitation are often familiar faces and not necessarily a stranger. No part of The Estate Lady® blogs, whole or partial, may be used without Julie Hall’s written consent. Email her at Julie@TheEstateLady.com. This may be hard for some to believe, but when a loved one dies, the things I see are deplorable. Children, siblings, extended family, friends, and neighbors descend on the estate like flies. Seriously? A life just ended, and this is what people think about .. the stuff and the money. In my career, I have truly seen the unthinkable; people hire me to uncover the most valuable items so they can choose those items before their siblings arrive (as I later found out). Children sneaking in the estate before the funeral, and even while the loved one was dying, to “help themselves.” I have seen neighbors or long-term friends approach the estate as if they were entitled, which makes me ill. I have seen families offer the caregiver a memento; then the caregiver uses their personal key to empty the house, literally, over the weekend, knowing the children are not there. When did people get so calloused and mean-spirited? It is very hard to understand people’s actions. Everyone always seems to get greedy, hard feelings and resentment follow, and in the long run, no one is happy. Here are a few helpful hints from The Estate Lady® to guide you in selecting an heirloom. Keep in mind that selections are ruled by emotions/sentimentality/nostalgic ties to the person who just passed. Examples would be photographs, their eyeglasses, a favorite perfume … small mementos that have little value to anyone but you. NOTE: This does not mean pack up the entire estate and keep all small items. It means be prudent and hold on to smaller items that you truly cherish. At some point, the emotional side must give way to logical consideration and reality. Separate the emotional from the realistic and see practical side. Will I really use it or can my sibling use it more? Will I have space for it? Is the cost to transport/ship too high to get it to my home? Don’t expect the estate to pay for shipping; arrange that on your own. Do I have to put it into storage? Think twice; storage gets very expensive. Consider the condition of the item. Older items can have serious problems: insect eggs in antique rugs, items in poor condition now unusable, mold on items, odors from smoking/animals/mildew. You don’t want to bring these into your home, especially if you have allergies. 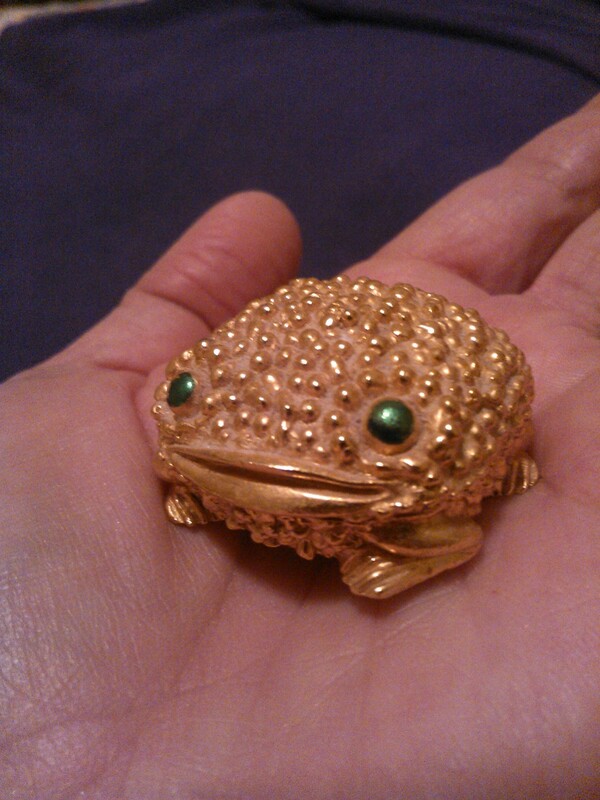 When our mom died, and my brother and I went back to their home to sort through things, I reached for this little gold tone frog with green eyes and solid perfume inside. I bought it for mom when I was 10 years old. I laughed every time I saw it, wondering why she kept it. One day I asked her. “Mom, why do you keep this silly little frog? I paid $1 for it when I was little.” She simply replied, “It always made me smile; I remember when you gave it to me.” Don’t you know I had to have that little frog? This is how you make solid, knowledgeable selections from the estate. Not based on worth, because money means nothing. Chances are pretty good your children won’t want that 9 ft. tall Victorian secretary. The value is in the heart and it will guide you! Turn the other cheek, be polite to each other, and put the memory of the person you lost before yourself to honor them. Friends and neighbors should step back, allow the family time to grieve, sort and make their selections first. Friends should not request anything unless the children offer it to them. If you can’t have a particular item, at least take a photograph and remember it that way. It’s not the end of the world if you don’t get the item you want. Life sure is getting harder … and weirder. Call me a twentieth century throw-back, but people and times seem to be changing fast and I don’t think it’s my imagination. Just yesterday, my husband and I were out taking a drive in the gorgeous Blue Ridge mountains enjoying the magnificent views. We had no clue where we were, other than a curvy country road. The adventure is half the fun! Out of the corner of my eye, I saw a huge yard sale and shouted to my husband to “Stop! Yard Sale!” Since being married to me, he has thrown his car into reverse more than he ever used to. Who would have thought that all the way out there with no street signs, but plenty of goats and chickens, you would find an awesome sale with great finds and reasonable prices? My family knows when I am “shopping sales” it’s best to leave me alone because it takes great concentration to select and negotiate the great buys. I piled up a few items, greeted and exchanged conversation with the sellers, and enjoyed their company. One seller there told me she had real jewelry – if I was interested – because I looked like the honest type. Lucky to be born with a kind face, I politely accepted her invitation to see the real stuff and she hauled me up to her front porch where it was all tangled and piled in her shoe boxes. Some of the pieces were very nice. She was only 40 but she looked much older, and I knew she had a story to tell – and tell, she did. Once the wife of a wealthy man, he was always unavailable to her, busy making his money. Her job seemed to be going out and buying jewelry. But he was also abusive to her. She escaped with her young son and her jewelry, and that was it. Now she was living in a tiny home in the middle of nowhere, where no one knew her. Her young son was by her side, as I expect he’ll be most of his life, taking care of mom. She told me she didn’t want to sell her jewelry, but that she had to. Her prices weren’t cheap, but the pieces were quality and I did purchase a handful from her. She was so appreciative. During the sale, an older woman was wandering around the front yard. She was very sweet, like your grandma, saw the jewelry and asked to see it. When the younger woman who had been helping me turned her back, the older woman took a handful of the good gold and silver jewelry and stuffed it in her pockets and in her blouse. Someone yelled out, “Hey lady, you can’t steal that stuff. That belongs to Karen and you haven’t paid for it!” It was quite a tense moment. No one really knew what to do because no one expected a sweet older woman to steal! Don’t get me wrong. Since the dawn of man, people have been stealing … from merchants, family, neighbors, even out of necessity. I can’t sit here and tell you I am the world’s most religious person, but I can tell you I am a person with strong moral convictions. The problem is that most people seem to have lost their own moral compass. I wonder where it all went in such a short time. I am a child of the 60’s and now it seems like that was eons ago. I also wonder when it was that I turned into my parents. I am officially an old fogey … but at least I’m a moral one. Shakespeare really understood human nature, tragic as it can be sometimes. From his King Lear in 1605, he writes about the pain of a thankless child. In an estate I was handling, I was privy to a situation that made my stomach turn. It still blows my mind! After all these years, certain situations still get to me … because I care. Before an elderly parent died, knowing what her children were like, she assigned a trusted friend to be the executor. The children were estranged, yet greedy. I cannot comprehend how a child can be estranged, yet still feel they are entitled to an inheritance. As I have often written in my books, we are entitled to nothing unless it is given to us. But that’s just my opinion. It seemed this parent left nothing to the children, save the personal property. And the hunger games began … literally. I wouldn’t want to be around when the karma train pays them a visit. This parent exited life knowing her children were like that. Even in death, they pathetically displayed every behavior that shouldn’t be allowed. This parent lived and died with disappointment and sadness, knowing the kids were like this. She did what she could from a planning perspective and put someone else in charge of the estate; this was a smart move. Was this a good parent? Who knows? There are two sides to every story, but the kids should at least be respectful in death. All of these children are middle age which means they are old enough to know better. They were angry that the parent had the last laugh, so to speak, and hit her in the wallet where it hurt. This was not a case of loving and missing a parent so much that they wanted select items for sentimental reasons. I watched as they stripped this once beautiful home like a school of piranhas would strip a cow bone. The only emotion was anger. Do your best to always be genuine, kind, respectful, and loving. Turn your cheek and bite your tongue often. Bad behavior can invade your soul, so don’t allow it. Bad behavior is contagious, so don’t allow it. Honor those who go before you, and then one day, you’ll be honored too. Bring as much “light” as you can to the situation. People can get lost in the dark during estate settlement situations. … And it’s going to get worse! Boomer children, be warned. While the poor economy is definitely a huge culprit when it comes to senior scams, we also need to face the fact that many people out there are indescribably unscrupulous, earning money to hurt the ones you love. I’ve often wondered how these people sleep at night and live with themselves, but I have come to realize these scam artists don’t seem to have much of a conscience. Since I have had several blog followers ask me to write about the scams that have robbed their loved ones in many different ways, I want to shed light on what our seniors are going through, that often as children we don’t see … or don’t want to see. The phone rings and it’s a friendly voice the elderly person is attracted to. Our elderly relative might be lonely or soft-hearted and give information they shouldn’t give to the stranger. Sadly, they are of a generation that may not fully recognize the impact of the world wide web and its power. The stroke of a finger on a keyboard could mean financial devastation to them, and their personal information is spread around the world in an instant, never to be retrieved. The telemarketers prey on them, promising a lottery, other forms of a windfall, and free stuff. There is no “free.” It all comes at a price. We must also take into consideration that many of our relatives suffer from dementia, and the effects it has on their logic and reasoning. In some cases, they don’t know any better, or they are just sweet-natured and gullible. Some even buy things from TV home shopping channels just to have social interaction with the customer service rep on the phone and the UPS man when he drops off their purchases. All seniors are targeted, both low income as well as high income, because it is perceived they have plenty of money saved. While scammers still do call, it is done less frequently. Remind them your number is on the “Do Not Call” list. Please do your research, and do everything in your power to protect your loved one! If you read last week’s blog, this title sounds like a contradiction to that article. Read on, and you’ll understand how parents can protect themselves and prepare their belongings for distribution without exploitation. In my work of helping seniors appraise the worth of their personal property, or liquidating it, I have seen examples of unsavory human behavior during the process. This comes from family, friends, neighbors, or strangers. In dealing with a lifetime accumulation of stuff, seniors are often at a vulnerable place in their lives and daunted by the task. That’s when predators appear, driven by insensitive greed and persuasive powers. These unscrupulous mischief makers could be stopped in their tracks if only the senior had the knowledge of how much their personal property was worth. They should also proactively create a master list of what they perceive to be treasures – either sentimental or financial. Parents should use professional appraisers to valuate their possessions now, adding the appraiser’s report to the master list, to protect from unscrupulous people, either inside the family or from outside. When seniors have avoided making these choices by doing nothing for their estate planning and distribution, they are actually making a decision with dire consequences. I always recommend that seniors distribute their treasures personally now, or in writing for distribution at death. When the gift is personally made, however, they have the satisfaction of seeing the joy on the face of the recipient! If a personal transaction is not done, then the next best thing is to write down who gets what on a master list. This master list should be kept safely with the will. Both documents will almost always minimize family disputes and exploitation. Problems generate when the children or close relatives are burdened with dealing with the death of the senior, the pressure of dealing with the estate, and the overwhelming task of disposing of the personal property. Seniors who recognize their own responsibility in this matter and make the decisions themselves are practicing the best defense against family quarrels or exploitation in any guise! Your parents, especially those who live alone, are vulnerable to scams and schemes for three reasons. First, seniors tend to be trusting. They also may be lonely and sometimes distant from those who can protect them. Senior parents are also vulnerable because they worry about their financial security. Finally, scammers know that many seniors have money and valuable possessions. Even though approximately 50 percent of elderly Americans are victims of financial exploitation, only 10 to 15 percent of the abuses are reported. Your parents protected you when you were young with advice and example. Look both ways before crossing the street, never speak to strangers, and a host of other suggestions were meant to protect you. Sadly, our parents reach a point where they need us to protect them! 1. Ask or discuss with your parents who has durable power of attorney. 2. Register your parents’ telephone numbers with the National Do Not Call registry (www.donotcall.gov). 3. Discuss with them the list of common frauds listed above. Ask them to contact you if they suspect anyone is trying to defraud them. 4. Ask your parents to contact you if anyone offers to buy any of their possessions. 5. Make sure a family member personally visits your parents on a weekly basis. If this is a challenge and you have other siblings, take turns. 6. Reduce junk mail for a small fee by going to either of these web sites: www.stopthejunkmail.com and http://mailstopper.tonic.com. The National Center for Elder Abuse is an excellent resource for information on financial and other forms of abuse against senior citizens. It publishes reports and conducts research on this growing problem. NCEA’s mission is to promote understanding, knowledge sharing, and action on elder abuse, neglect, and exploitation. Its web site also offers links to other excellent resources and organizations also devoted to protecting senior citizens. Their web site is www.ncea.aoa.gov. Honor your parents by standing between them and anyone who sees them as an easy target. Oh Brother, Sister! What Have You Done? My experiences with client cases never cease to amaze me. This one amazed even me! An elderly client passes away with much of her family estranged from her. Interestingly enough, every time we went into the estate to conduct work, more and more was missing – mostly the “good stuff.” (This is why you change the keys/locks after a loved one dies.) So we reported it to the estate administrator and the keys were changed promptly. That is fairly typical in most estates, and you might even have your own stories about family helping themselves. What happened next is unthinkable! As with all deaths, the executor or attorney needs to close all accounts, settle debt, etc. Imagine the surprise when the credit card bills came rolling in AFTER the date the woman died! Come to find out it was a family member who did it and is being (and should be) held financially responsible. As we were cleaning out the estate, we discovered something that at first made no sense. Where was her purse? It was nowhere in sight. Someone swiped her purse! Probably the same one who took her credit card. It’s hard to believe people like this exist out there. How could someone stoop so low as to steal from a deceased sister? This is another reason to plan your estate and distribute it prior to passing away, if you can. No one should be taken advantage of, especially when someone is no longer here to protect themselves. There’s a reason why greed is one of the Seven Deadly Sins. It eats people alive whether they realize it or not. The battle between good and evil has been around since the dawn of man. The Bible is filled with verses about such things. It’s all about the desire to “possess.” Possess money, things, people, etc. It is natural for humans to want more. But, when is enough, enough? For some people, there can never be enough. We see greed at every turn when settling estates. It is far more common than you realize. Our smaller homes aren’t good enough so we tear them down and build bigger ones, so we can fill them with more stuff. When a loved one dies, we are the first to take things from the estate, justifying that these things are a memento or sentimental. Then we look at our own homes, and if our eyes are open, we realize we have too much, while there are those out there who have nothing. Bottom line is: you can’t take it with you! Start now by giving away things you don’t need, don’t want, or haven’t used in a while. So many people need your help and generosity, especially in economic times like these. Your gift can bring a smile to someone you may never see, but you will feel in your heart.